Although it seems easy enough, watering house plants is responsible for killing more plants than anything else. These indoor plant watering tips will help to keep your plants healthy. So How Much Water Does a Plant Need? Brrr! House plants hate cold water! Have you ever stepped into a shower while the water was still cold? Quite a shock isn't it? Well, it's the same for house plants. Watering house plants with cold water can slow growth or damage roots. Use tepid water. Or, let cold tap water warm up to room temperature overnight. The answer varies with the species and its native habitat, the soil in which it is growing, and the light, temperature, and humidity in your home. Plants with a lot of leaf surface or soft, lush foliage will be thirstier than those with less foliage or waxy or leathery leaves. House plant watering needs are also affected by the growth cycle of the plant. A plant absorbs more water during active growth periods (in spring and summer) than during rest periods. What kind of pot have you got? The size and type of container are other important factors: in a small pot, moisture is absorbed quickly, a too-large pot will retain too much water. A plant in a porous clay pot will need watering more frequently than one in a plastic or glazed pot. To find out more, take a look at Pots and Containers. Wondering about that white crusty stuff on the surface of your plant's potting mix? It's a build up of soluble salts that come from tap water and fertilizers. These salts not only look unsightly, they can damage foliage and roots. You'll notice plant damage as wilted, yellow or scorched leaves. Fortunately, getting rid of excess salts is easy. Place your house plant in a sink or take it outdoors on a warm day. Slowly pour tepid water over the potting mix. Allow water to drain out the drainage holes of the pot. Pour more water through the pot, then empty the drainage tray. This simple task will make your plant healthier and takes only minutes to do. Make sure the plant is thoroughly watered and then allowed to dry out a bit before it is watered again. Water well, but not often. 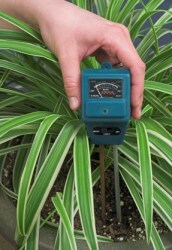 A moisture meter can help you measure the moisture in the soil. If you don't have one, just poke your finger in the soil up to the first knuckle -- it's the surefire way to know if your plant needs watered. Does the soil feel damp? Don't water. Does the soil feel dry? Water. You'll find specific house plant watering needs for each plant in the House Plants Encyclopedia A-Z. Contrary to popular belief, over-watering house plants is more often the cause for a plant's problems than under-watering. Since roots cannot absorb more water than the plant needs, the excess water will take the place of oxygen in the soil. Plants need oxygen just like we do. Soggy soil suffocates the roots and leads to rot. Tip the plant on its side for a few minutes to allow the water to drain out. Cover the top of the soil with paper towels to absorb the extra moisture. Replace them with dry paper towels when they become saturated. If the plant starts to wilt or lose its leaves, repot it right away with fresh soil into a container that has good drainage. Use water at room temperature (68° F/20° C). Water thoroughly, then allow the soil to dry out a bit before watering again. Don't over-water -- it's the #1 reason house plants die.